Now with revised text and references (2011), this book aims to provide a general overview of dermatology of the dog and cat in a case based format. 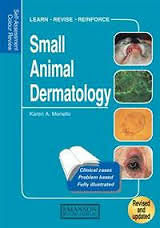 It contains over 200 clinical cases and self-assessment problems reviewing the most common skin diseases encountered in clinical practice, plus some more obscure diseases that a veterinarian will encounter only occasionally or rarely. The cases appear randomly to reflect real life practice and vary in complexity. Coverage ranges from the more easily treatable to the most difficult and serious cases. The self-assessment format, featuring questions, top quality colour illustrations and detailed answers and explanations is designed to educate, not just to test. It appeals to all those dealing with skin diseases in small animals, veterinary practitioners and students, veterinary nurses and technicians.